Programming is an activity prone to frustration and difficulty—even when done as a hobby. Creating a web, mobile, or desktop app is a big undertaking, and good note-taking skills are key to staying organized and not succumbing to stress, despair, and burnout. But most note-taking apps aren’t designed with programmers in mind, and they can be so difficult to use that they drive you to give up on notes entirely. Here are some of the best note-taking tools for programmers and coders. 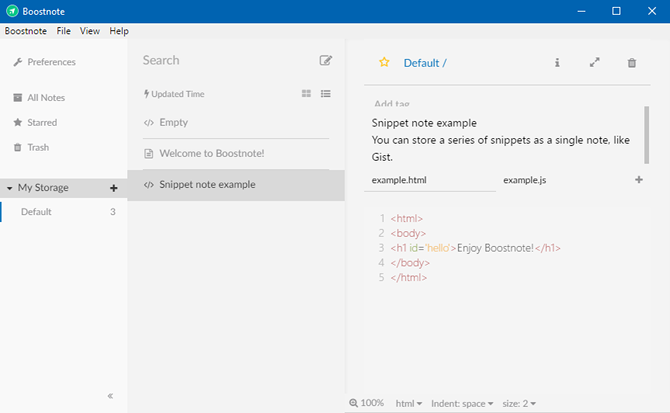 Boostnote is a prime example of a note-taking app for coders. It doesn’t have all the features of a modern note-taking app (e.g. it has Markdown formatting and folder-based organization but lacks web clipping or handwritten notes) but does have what all programmers love: snippets! The best part about Boostnote is that it’s free and open source, it’s cross-platform, and your notes will sync across all platforms you use Boostnote on. MedleyText is very similar to Boostnote, with fewer features but a tighter focus on the features it does have: rich text formatting options, embedded code blocks within normal notes, and customizable themes and keyboard shortcuts. It’s excellent for highly-productive coders with big projects. 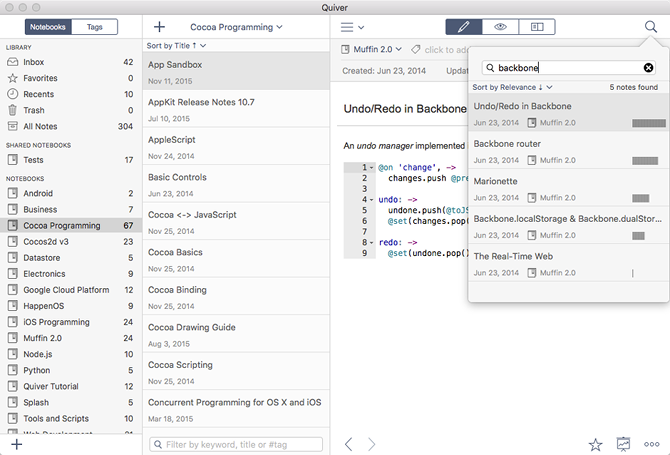 When you embed formatted code directly into notes, the app will automatically highlight the syntax. Or you can manually select which syntax highlighting language to apply to any given block of code. It supports over 40 programming languages as of writing this article. While MedleyText was once free for local notes, that’s no longer an option. It’s now a premium app with a hefty free trial and worthwhile features like syncing via Dropbox and sharing notes via links. Quiver is yet another app like the two above: you can mix and match text (in both Markdown and LaTeX formats) with embedded code inside notes. However, Quiver has a dedicated code editor right inside the app that’s cleaner and more responsive than its competitors. As for syntax highlighting, this app supports over 120 programming languages. Cloud storage sync is available for Dropbox, Google Drive, iCloud, and more. And because notes are stored as JSON, you can safely use version control to track changes. Shared notebooks even allow for collaboration between teammates on large projects. It even has a web clipper! If Quiver is so great, why is it listed third? Because it’s only available on Mac. While the Mac operating system can be a wonderful programming environment, Quiver is not an option for programmers who routinely hop between other operating systems. OneNote is the best note-taking app, period—but until recently, it lacked syntax highlighting abilities which programmers so desperately need. 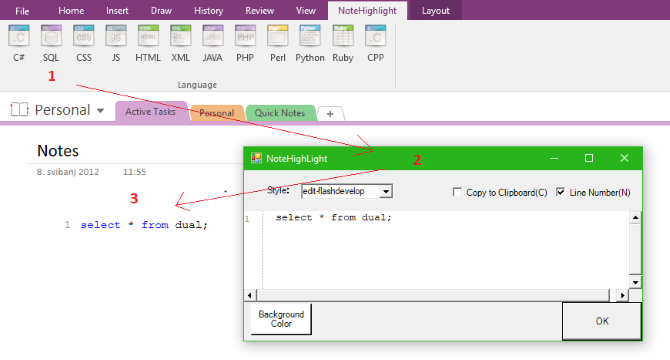 Fortunately, thanks to a free add-on released by a GitHub user, OneNote can now do syntax highlighting for code. The add-on is admittedly a bit clunky, but it’s nice to know you can finally use OneNote for storing code notes. Since OneNote is one of the best ways to take notes as a student, this is particularly good news for students in programming and engineering curriculums. CherryTree is unlike most note-taking apps in that it’s more of a personal wiki. However, since pages can be nested under each other in a hierarchy, it’s more than good enough for taking notes. What makes it a wiki? You can insert links to any other page throughout the notebook. 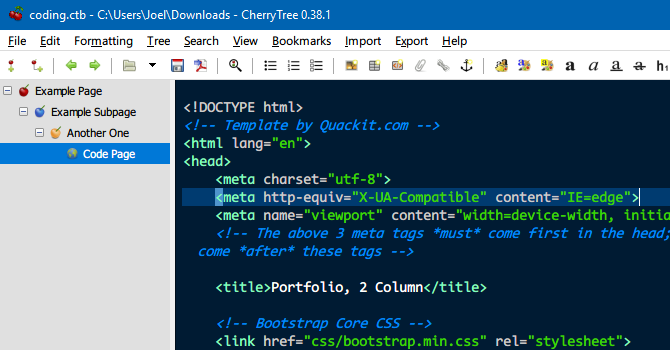 There are other apps like CherryTree, including wikidPad and Zim, but CherryTree supports a special page type specifically for code. Use regular notes for ideas and tasks, use the code notes for snippets. As far as the page hierarchy, both types work the exact same way. CherryTree is very fast, making it one of the best lightweight note-taking apps. As a programmer, you likely know about Sublime Text already. 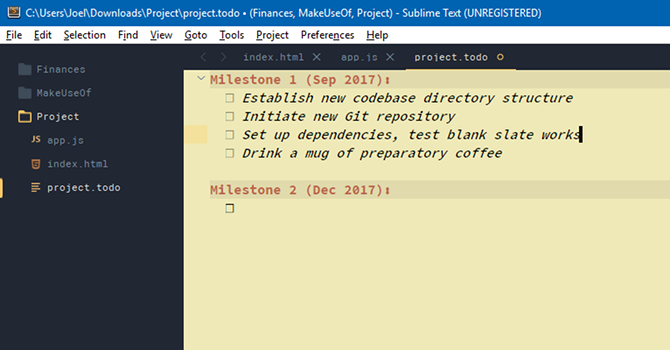 True, it’s a text editor and not a note-taking app, but it can certainly be used for taking notes: every note as a text file, and every code snippet in a separate language-appropriate file. Sublime Text’s native features are excellent for increasing overall productivity, and the ability to split into multiple editor panes is indispensable. But for note-taking and organization, it can get even better with a few free plugins. SideBarEnhancements is a must-install for every Sublime Text user. It adds a number of improvements to the sidebar, mostly in the menu when you right-click files. PlainTasksincorporates a task-style to-do list right inside the editor. And MarkdownEditing is nifty if you want your notes to be taken down in Markdown. Sublime Text is pretty costly, but the free evaluation period never ends. As long as you can deal with an occasional pop-up that reminds you to purchase the full version, you can use Sublime Text for free indefinitely. TickTick is a to-do list app that’s pretty similar to other apps of its kind, but it has one subtle feature that makes it good for taking notes: every list item has a “description” field that’s basically an entire notepad. Plus, you get all the benefits of a full-blown to-do list app: folder organization, subtasks, recurring tasks, reminders, priorities, etc. TickTick has a free plan with a limited number of lists, and a paid plan for $28 per year. If you’re checking out this note-taking tool list to help the programmer in your life, TickTick is actually one of many great gifts for programmers. If all else fails, you can always stick notes right within your code as comments. It isn’t really the best approach because it can get messy (tips for writing cleaner and better code), but it’s an option for low-level notes pertinent to certain snippets. Either way, keep going and keep improving. Programming is tough, so check out these tips for learning to code without stress. And if you ever feel stuck, here are ways to overcome programmer’s block.